Newport began as two separate settlements, one of which, then called Red Rock, was settled shortly after the land was purchased by the U.S. government in 1837. The name Red Rock was derived from a granite boulder, an unusual glacial erratic, which was held in great reverence by the Dakota, who painted it with vermilion. The earliest settler was John Holton, a young farmer from Pennsylvania, who came in the spring of 1837 with Rev. Alfred Brunson from Illinois to open a Methodist mission for the Indians. The mission was in Dakota County near the Indian village called Kaposia, now in South St. Paul. 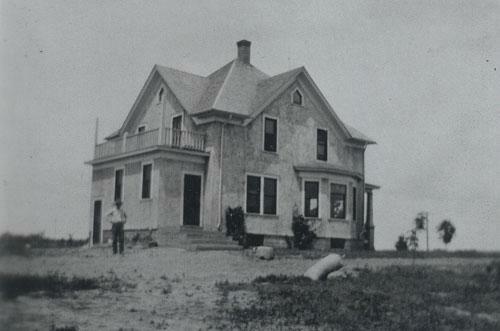 Holton soon moved his family across the Mississippi, building a home near what is now the intersection of Bailey Road and Interstate 494. Two years later, Rev. Benjamin T. Kavanaugh replaced Brunson. Because of unrest between the Dakota and Ojibwe he decided to move the entire mission across the river where he built a two-story log church and school on part of Holton’s claim. In 1841 John A. Ford and Daniel Hopkins built a trading post and house next to the Kaposia log mission. When the mission closed in 1844, the post office was moved to Ford’s trading post and the name of the settlement changed from Kaposia to Red Rock. Soon steamers were tying up at the Red Rock landing. In May 1850 John and Eleanor Bailey and their nine children arrived on the Dr. Franklin. The Bailey’s eldest son was John Vincent Henry Bailey, who became a well-known farmer and fruit grower. His son, John Vincent Bailey, Jr., founded the Bailey Nurseries, which has become the largest nursery in Minnesota. Joseph Irish came in 1851 with 27 cows and established a dairy, processing the first cheese in the state, which he sold in St. Paul. Other early settlers in the area were William R. Brown in 1841, William Johnson in 1847, Elias Scofield and R. C. Knox in 1850, and William and Giles Fowler in 1852. In 1852 the small settlement of Newport was located about a mile south of Red Rock, separated by open fields. Newport began to develop when E. M. Shelton and his two brothers built a steam-operated sawmill in 1857. The mill overlooked a spring-fed pond, which they dammed up to use as a log-holding area. Logs came from the upper Mississippi, Rum, and Crow Wing Rivers. By the 1870s Newport had a school, flour mill, store, and several warehouses. Newport Township was organized in 1858 with the Mississippi as the west and south boundaries, Red Rock Township on the north and east and Cottage Grove Township on the east. Red Rock Township, renamed Woodbury in 1859, then included the village of Red Rock. In 1861 Red Rock was annexed to Newport Township. In 1869 Red Rock became the site of Methodist camp meetings. John Holton donated 10 acres to the “Red Rock Camp Ground Association,” which held meetings each July that drew single-day crowds of 20,000 people. Special steamboats and trains brought people from St. Paul twice a day. By the 1880s, however, attendance began to decline rapidly. When St. Paul Park was platted in 1887, Newport Township was divided into two parts, with Newport and Red Rock to the north and Grey Cloud Island on the south. In 1889 the Village of Newport, including the former Red Rock settlement, was incorporated. In 1920 two major businesses began operation in Newport: the Farmer’s Terminal Meat Packing Company (Cudahy) and the Farmer’s Terminal State Bank. Another large employer, the Fritz Candy Company, was started by Joe Fritz in 1940. As the old Indian trail to St. Paul morphed into Hastings Avenue and was improved to a federal highway, automobile tourists began to find Newport. By the 1930s the area had the Newport Motor Inn (which sold Willys-Knight and Whippet cars), Newport Plaza, Wright’s Eat Shop, and several stores and cafes. In the 1940s came Boyd’s tourist cabins and Texaco service station. In 1930 Newport’s population was just 480, surging in the 1940s to over 1,800. Newport became a city in 1974 with a population of about 3,000. It has remained steady and in 2005 the population was estimated at 3,750.